The HTS working group has been supporting the development of the HTS current leads for ITER since 2008. 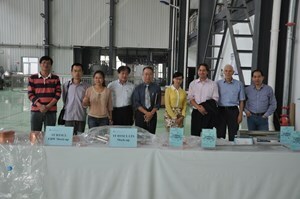 Pictured in Heifi for its 12th meeting: Tingzhi Zhou, HTS lead team leader, ASIPP; Peng Li, quality inspector under contract with ITER; Vicky Tao, Keye (one of the two HTS current lead manufacturers); Suichi Yamada, working group member from NIFS; Tadashi Ichihara, working group member, formerly from Mitsubishi; Jun Li, head of feeder quality assurance at ASIPP; Pierre Bauer, in charge of HTS leads for ITER; Tom Taylor, working group member, formerly from CERN; and Yifeng Yang, working group member, University of Southampton. High Temperature Superconductor (HTS) current leads are the components that transmit the large currents from room-temperature power supplies to very low-temperature superconducting coils. 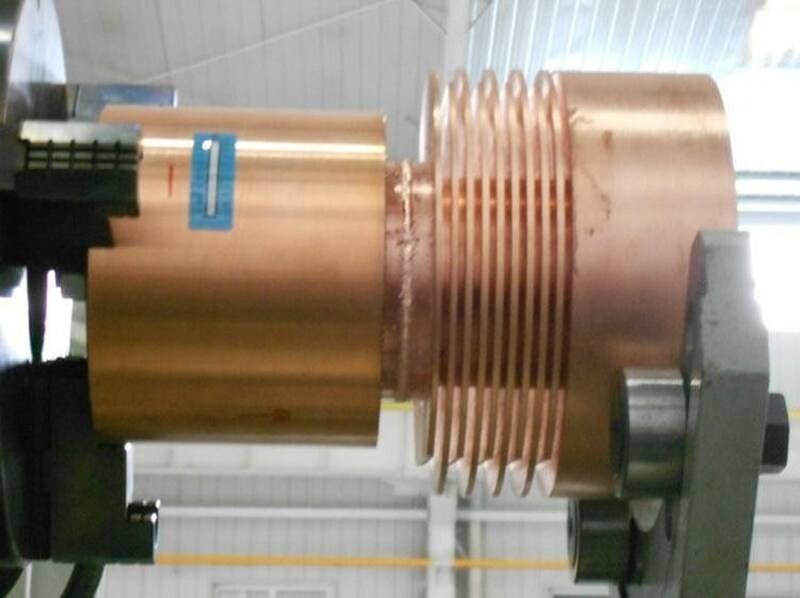 HTS current leads use a short segment of high temperature superconductor that can sustain much higher current densities than even good conductors such as copper, allowing the reduction of the material cross-section and the related heat conduction by about tenfold. Power and installation cost savings with HTS current leads are estimated at approximately 20 percent of the total heat extraction capacity of the ITER cryoplant. 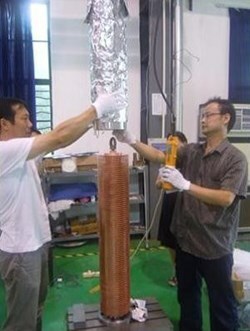 The current leads for the ITER Tokamak have come a long way: from the original 60 kA proposals from the Japan Atomic Energy Research Institute (JAERI) and European partners (KIT's "demonstrator"), to the first prototypes fabricated and tested in China at the Chinese Academy of Sciences, Institute of Plasma Physics (ASIPP), and now on to the presentation of the HTS current lead mockups at the 12th HTS working group meeting that took place in ASIPP (Hefei, China) held last week from 10-11 October. A mockup of eletron beam welding. Targeted trials of specific technologies have been required from each supplier to prepare for the fabrication and testing of prototype units. The HTS working group, which brings together experts from institutes in Japan (NIFS), Europe (CERN), China (ASIPP) and the ITER Organization, has been supporting the development of the HTS current leads for ITER since 2008. Yuntao Song, the project manager for the ITER feeders at ASIPP, gave the 12th working group a warm welcome, stressing that "the HTS current lead team in ASIPP has spared no effort and no expense to deliver the HTS mockups on time." The current lead mockups presented this week were fully endorsed by the working group, thereby giving ASIPP and China the ITER Organization stamp of approval for the manufacturing process and technology for the 60 large-scale HTS current leads that ITER will need. "The development and manufacture of the HTS current lead for ITER goes significantly beyond the present state-of-the-art of those used for the Large Hadron Collider or the stellarator project Wendelstein 7-X," says Arnaud Devred, leader of the Superconductor & Auxiliaries Section at ITER. "Thanks to the hard work and dedication of the young team at ASIPP and the support provided by the ITER Organization and its experts, a significant milestone has been achieved, paving the way to the manufacture and testing of prototypes of each HTS current lead type." Procurement Arrangement specifications required that, following the development of the designs of ITER's three types of current leads, targeted trials of specific features were required from each supplier to prepare fabrication and testing of prototype units in ASIPP. Five different types of mockups were made to develop the most critical technologies in preparation of series manufacturing (insulation, electron beam welding, heat exchanger manufacturing, low temperature superconductor end assembly, and instrumentation). In preparation for mockup manufacturing, 80 quality documents had been submitted by each of the suppliers; these were reviewed by the ITER Organization and the HTS working group. This documentation represented the basis against which the actual manufacturing process had been assessed by the suppliers' quality assurance staff. The ITER Organization dispatched quality inspectors to the suppliers to witness the most critical operations. "This was the first Manufacturing Readiness Review for one of the main magnet systems and represents a clear step forward for ITER Construction," commented Neil Mitchell, Magnet Division head, with satisfaction. "In this two-day face-to-face meeting we were able to confirm the quality of manufacturing development and our readiness to launch the prototype."